The Massachusetts Institute of Technology has filed a negligence suit against world-renowned architect Frank Gehry, charging that flaws in his design of the $300 million Stata Center in Cambridge, one of the most celebrated works of architecture unveiled in years, caused leaks to spring, masonry to crack, mold to grow, and drainage to back up. 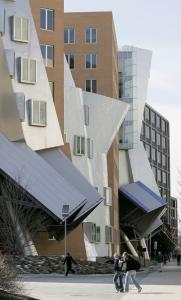 The suit says that MIT paid Los Angeles-based Gehry Partners $15 million to design the Stata Center, which was hailed by critics as innovative and eye-catching with its unconventional walls and radical angles. But soon after its completion in spring 2004, the center's outdoor amphitheater began to crack due to drainage problems, the suit says. Snow and ice cascaded dangerously from window boxes and other projecting roof areas, blocking emergency exits and damaging other parts of the building, according to the suit. Mold grew on the center's brick exterior, the suit says, and there were persistent leaks throughout the building. The suit says it cost MIT more than $1.5 million to hire another company to rebuild the amphitheater, with new bricks, seats, and a new drainage system. The institute alleges that both Gehry Partners and the construction company, New Jersey-based Beacon Skanska Construction Company, now known as Skanska USA Building Inc., violated their contracts with MIT and are responsible for construction and design failures on the project. The 400,000-square-foot Ray and Maria Stata Center, on Vassar Street, also houses labs, offices, classrooms, and meeting rooms, and features a "street" that winds through the ground floor. "Gehry breached its duties by providing deficient design services and drawings," says the suit, which was filed in Suffolk Superior Court in Boston on Oct. 31 and seeks unspecified damages for costs and expenses incurred by MIT. Gehry Partners did not respond to repeated calls and e-mail yesterday from the Globe. A spokesman for MIT declined to comment because of the pending lawsuit. An executive at Skanska's Boston office yesterday blamed Gehry for problems with the project and said Gehry ignored warnings from Skanska and a consulting company prior to construction that there were flaws in his design of the amphitheater. "This is not a construction issue, never has been," said Paul Hewins, executive vice president and area general manager of Skanska USA. He said Gehry rejected Skanska's formal request to create a design that included soft joints and a drainage system in the amphitheater, and "we were told to proceed with the original design." After the amphitheater began cracking and flooding, Skanska spent "a few hundred thousand dollars" trying to resolve the problems, but, he said, "it was difficult to make the original design work." He said Skanska, which built Gillette Stadium, the State Street Financial Center, and Terminal A at Logan International Airport, tried to work with MIT, and attended mediation with the university, but was unable to resolve all issues. Hewins said two consulting firms hired by MIT agreed with Skanska's assessment that Gehry's initial design was flawed and that the amphitheater had to be completely rebuilt. "We worked hard to work with MIT to bring this to resolution . . . but it was a design issue," Hewins said. "It really is a disaster," said former Boston University president John Silber, who sharply criticizes the Stata Center's design in a new book, "Architecture of the Absurd: How 'Genius' Disfigured a Practical Art." After learning of the lawsuit yesterday, Silber said Gehry "thinks of himself as an artist, as a sculptor. But the trouble is you don't live in a sculpture and users have to live in this building." Gehry, one of the world's most famous architects, designed the Guggenheim Museum in Bilbao, Spain, one of the most acclaimed architectural structures of the 1990s; the Walt Disney Concert Hall in Los Angeles; and the recently completed IAC/InterActive Corp headquarters in New York. Gehry is not the first famous architect to be sued over the design of a local landmark. I.M. Pei and Partners, the architects who designed the 60-story John Hancock Tower, were sued, along with a handful of contractors and engineers, after panes of glass began popping out of the Back Bay building and crashing onto the street below during its construction in the 1970s. It drew worldwide publicity as "The Plywood skyscraper" when its glass was temporarily replaced with wood. The case was settled out of court. Robert Campbell, an architect who is a critic for the Globe, said it is inevitable that there will be problems in any unconventional building like the Stata Center, which has roofs colliding at different, odd angles. "It looks like something out of a Disney cartoon," Campbell said. "It's really quite pleasurable and people like it, but it does involve some risks in that it's impossible to keep it from leaking." In its suit, MIT said it wanted to create a complex of buildings on the nearly 3-acre site along Vassar Street designed to "catalyze interactions and innovations among MIT's faculty and students in computing, information science, artificial intelligence, and linguistics and philosophy." The result, Campbell said, helped to break up the monotony of a street of concrete buildings. "Because he's so daring, you figure you've got to be daring, too, if you're a client," Campbell said. "You know if you hire Frank Gehry there are going to be new kinds of problems." But he said clients accept the risks because "they'll get a building like no other building."